On Wednesday night, the Miami Heat will face off against the Brooklyn Nets in Brooklyn in what will be Dwayne Wade’s final game in the NBA. The Heat have been eliminated from playoff contention, and the Nets are already in so this game does not have playoff implications. The Heat are coming off a 122-99 win over the 76ers on Tuesday night. Dwyane Wade put on a show in his final home game of his career. Wade scored 30 points on 10 of 23 shooting to go with 3 rebounds and 3 assists. He was followed by Bam Adebayo, who scored 29 points on 8 of 11 shooting and led the team with 9 rebounds. Justice Winslow tallied 16 points on 6 of 9 shooting to go with 3 rebounds and 2 assists. Hassan Whiteside scored 15 points and grabbed 9 rebounds to tie Adebayo in just 14 minutes off the bench. Goran Dragic led the team with 13 assists. The Nets are coming off a 108-96 win over Indiana on Sunday which clinched their playoff berth. D’Angelo Russell led the way with 20 points on 7 of 15 shooting to go with 6 rebounds and 6 assists. Joe Harris tallied 19 points, and Caris LeVert scored 28 points off the bench. Jarrett Allen and Spencer Dinwiddie each scored 12 points. Allen tied with Rodions Kurucs for the team lead in rebounds with 7 and Dinwiddie tied Russell for the team high in assists with 6. The Heat are without their leading scorer Josh Richardson, who averages 16.6 points a game. Next in line is Dwyane Wade, who is averaging 14.9 points to go with 3.9 rebounds and 4.1 assists. Goran Dragic averages 14.1 points and leads the team with 5 assists per game. Justice Winslow scores 12.6 a game and Dion Waiters scores 12.3 a game. Hassan Whiteside also tallies 12.3 points a game and leads the team on the glass with 11.3 rebounds per game. Tyler Johnson and Kelly Olynyk also average double figures with 10.8 and 10 points a game, respectively. The Heat average 105.9 points per game. 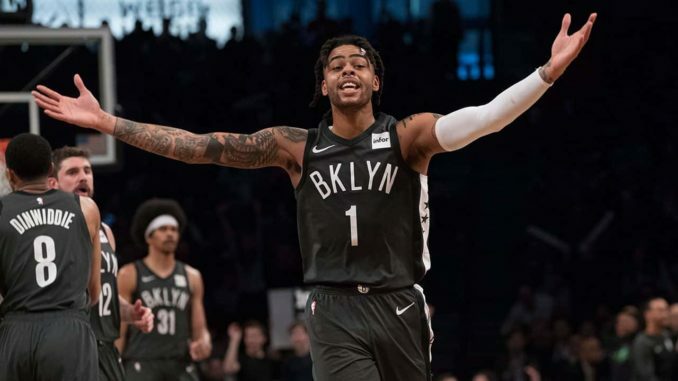 The Nets are led by D’Angelo Russell, who is averaging 21.1 points per game to go with 3.9 rebounds and a team-high 7 assists per game. Spencer Dinwiddie scores 16.9 points a game and dishes out 4.6 assists per contest. Caris LeVert averages 13.8 points a game and Joe Harris is chipping in 13.7 a game. LeVert and Harris each grab 3.8 rebounds per contest. Demarre Carroll averages 11.1 points and 5.2 rebounds per contest. Jarrett Allen is the final Net averaging double figures with 11 points a game and is leading the team with 8.3 rebounds a game. The Nets are averaging 112.2 points per game. The Nets come in at -3.5. The Heat are not playing for anything in this one but expect Dwayne Wade to put on a show in his final game ever. He is going to want to go out with a bang and will look to finish his farewell tour on a high note. Other than that, I don’t think the Heat will bring much energy in this one. The Nets are locked into a playoff spot, but this game could affect seeding, so they are still playing for a little something. Also, they will want to try to build some momentum going into the postseason and will want to go in on a high note. I think the playoff factor will be the driving force behind a relatively easy Nets win. Take the Nets -3.5.